The best place to stock up on back to school supplies and epic crafts to make with white school glue. It’s back to school time and that means mom everywhere are stocking up on school supplies for the kids. Recently, I simultaneously had one friend asking me where the best place to shop for supplies are and another ranting about how much white school glue she had left over from last year. As I responded to each of them I knew there were plenty of other moms out there with the same dilemma, and here we are…discussing the best place to stock up on school supplies and what to do with all the left over white school glue! Each year, armed with our lengthy list, we tackle the back to school shopping. Over the years I have found that the best way to do this is with one stop shopping at Walmart. I like to shop early, when everything has just been put onto the shelves – typically sometime in July – and get it all done in one sweep. It’s become a sort of tradition for us to wander aisle by aisle checking off the items on our list as we go – 18 file folders, check! 16 glue sticks, check! 12 composition notebooks, check! After we’ve hit the classroom supplies we make sure to grab boxes of tissues, cleaning wipes, and hand sanitizer for the classrooms and then each of the children choose their new backpack, lunch box, and water bottle. We can get ALL of the lists checked off in one shopping trip and get the best prices – ummm hello, $0.15 folders?! Yes please! If you’re shopping in your local area, they usually have your school districts supply lists on hand too! You know, just in case you lost it. They’ve made sure that these lists are accurate by integrating the popular resource, TeacherLists, into a dedicated back-to-school shopping destination. This will enable customers like you to connect with classrooms to get school supply lists directly from teachers – so this isn’t a best guess supply list; it’s the real deal from the teachers themselves. Remember Walmart’s Holiday Helpers from last Christmas season? Well guess what? They’re back to help out with the back to school shopping too! 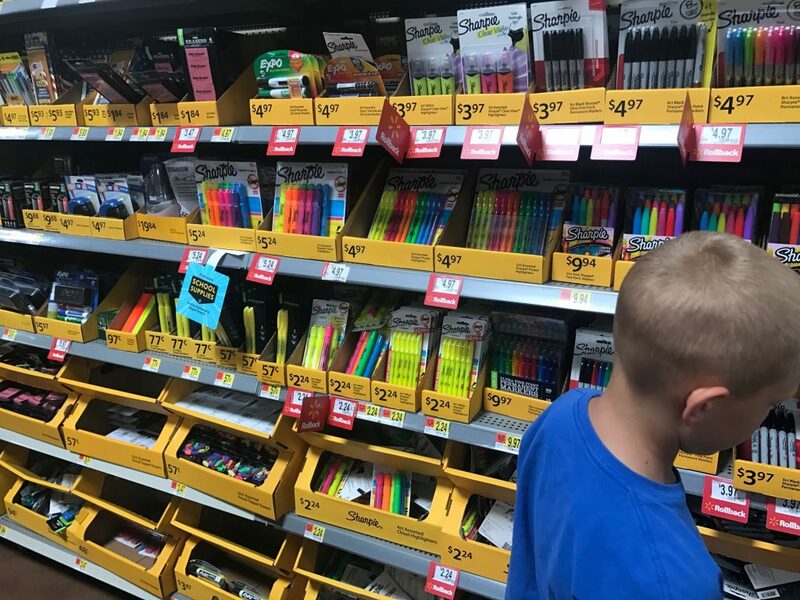 They’re helping for the first time this school year and are ready to assist customers to checkout, find the shortest lines and add any last-minute items they may have forgotten. If you’d like to avoid the shopping all together you can use Walmart’s online grocery store pick-up! There are now hundreds of back-to-school staples available for Online Grocery Pickup shopping (a 150 percent increase*) so you can stock your fridge with lunchroom favorites at the same time as shopping for supplies and have them delivered right to your car. So now that you’ve stocked up on those $0.25 bottles of white school glue – what do you do with it all?! Why you craft of course! 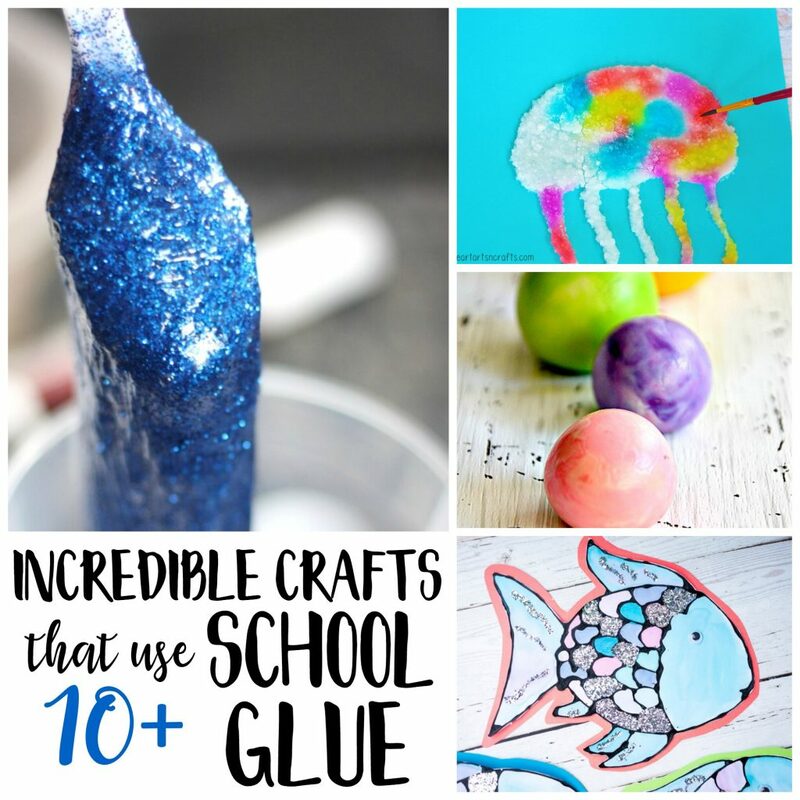 And I’m not talking about your basic, “let’s glue some construction paper together” type of crafting – I’m talking totally epic crafts and projects that you can make with white school glue. Turn the original white school glue, black with this easy tip to make black glue, and create gorgeous stained glass style paintings. You can really turn that plain old white glue any color you want and explore all sorts of uses for it. Have you ever heard of Salt Painting? You will not believe how the colors turn out with this art technique! We love to use texture when painting and homemade puffy paint is so fun to make and use. Decorate and hang your own sun catchers – there are endless possibilities once you know how to make these, create new ones for every season and holiday! Create a work of art on fabric with this batik art process. Use a homemade air dry clay to mold into shapes. You can even make your own bouncy balls! And of course you can’t forget slime, floam and all the other sensory doughs! They are a favorite in our house so we have tried out lots of fun recipes. Do you have a favorite craft using white school glue? I’d love to give a try!